The British Library is marking the Britten anniversary with a special exhibition. Poetry In Sound: The Music of Benjamin Britten opens tomorrow in the Library’s Folio Society Gallery, running from 31 May until 15 September. In that time the Library, located just along the road from Kings Cross and St Pancras International stations, will host a number of interesting complementary events, with talks from leading Britten scholars and musical performances. The exhibition itself has much of interest, and is nicely paced, taking in Britten’s poetic, literal and musical influences, illustrating vividly how the written word can come alive in the right musical hands. Pride of place goes to the score of The Young Person’s Guide To The Orchestra, presented in its first – and only – draft. It is incredibly easy to read, and so simple when down on paper – a reminder of how Britten could make music look basic but sound complex or special. Taken chronologically, the exhibition looks at the influence of W.H.Auden on Britten’s career, and the compatability of his words and Britten’s music – with visuals in the form of the complete Night Mail, which is a most enjoyable watch. On one of several listening posts there are rare performances from Pears and Britten of the Cabaret Songs, which use Auden’s text. There are pieces devoted to Peter Grimes, with a striking copy of Crabbe’s poem The Borough. There is the first program of Gloriana, and pieces on The Turn of the Screw and Death in Venice, with close attention paid to Britten’s sense of dramatic pacing and his keen ability for making melodies from text that might look angular or uncomfortable on the page. Passages from the War Requiem are if anything even more striking, with pictures of Coventry Cathedral, the original review from The Times and the first draft of Wilfred Owen’s Anthem For Doomed Youth, placed alongside Britten’s first draft of the remarkable moment when we first hear the poem in the piece, not to mention the singers and the chamber orchestra. It is a vivid pairing indeed. Similarly striking are two texts used by Britten in the Serenade – Charles Cotton’s Pastoral and Ben Jonson’s Hymn – reading them brings the music to life immediately. The pacing is ideal, and with the focus rightly on the sung and spoken word over the instrumental works, the exhibition should grab the attention of regular library visitors. If you are visiting London – and arriving in Kings Cross from East Anglia perhaps – take an hour to pop by and look. You’ll find it time well spent! A panel, including conductor Steuart Bedford, viewed as a leading Britten expert as a result of his collaboration with the composer and Professor Paul Banks from the Royal College of Music, explores Britten as a performer. The specially-formed ‘Friday Afternoon Choir’ will perform ‘Friday Afternoons’, Britten’s much-loved suite of children’s songs. The choir is made up of members from three of Camden Music Services’ Choirs; The Camden Youth choir, Camjam Voices and The New Foundling Children’s Choir. Conductor and Britten expert Paul Kildea discusses his book, explores the private and creative life of Britten and provides an intimate portrait. Join Dr Nicholas Clark, Librarian of the Britten Pears Foundation, to hear how the opening of a new building adjacent to the composer’s home makes this material much more publicly accessible and heralds a new era of activity, appreciation and celebration of the man and his music. 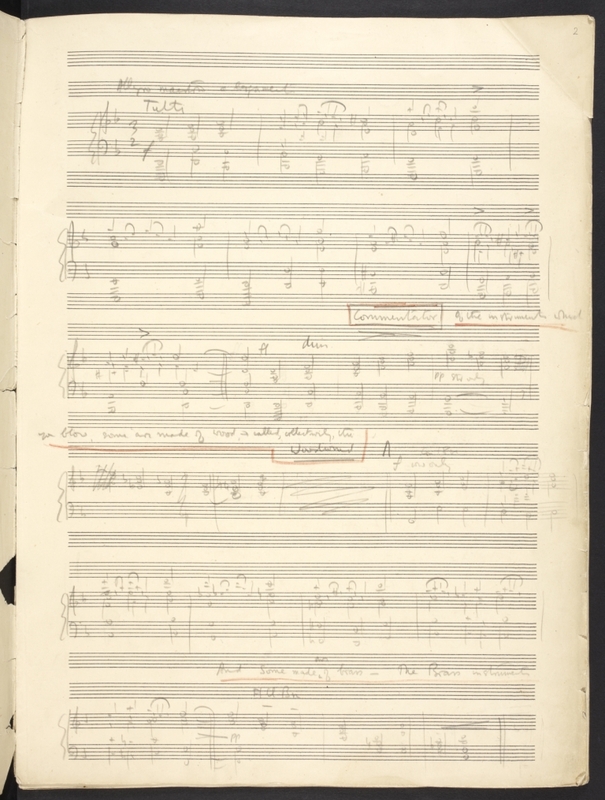 Last year the British Library acquired a draft manuscript of Benjamin Britten’s Young Person’s Guide to the Orchestra. British Library Music Curator Nicolas Bell will tell the story of the composition of this famous work, originally written as a film score and later adapted as a concert piece. More details can be found at the British Library website. This entry was posted in News, Uncategorized and tagged Benjamin Britten, British Library, George Crabbe, Peter Grimes, W.H. Auden, War Requiem. Bookmark the permalink.